The evolution of smartphones has led to the development of mobile apps for different devices. Mobile app developers use different platforms to develop apps. Java is a well known platform for the development of applications that are Java-based. Many desktop applications and web apps, as well a number of Java-based phones use Java applications. Now, Java developers can also write applications for popular device platforms like Android, iOS, Windows, Blackberry, etc. Codename One is a new, open source, Java based platform that can be used to build applications for a number of devices, like iPhone, iPad, Android phones and tablets. There are two popular Java Integrated Development Environments (IDEs) that let you create Java applications interactively – the NetBeans IDE and the Eclipse IDE. Codename One has plugins for both IDEs. Download and install the appropriate plugin and Codename One will be automatically be integrated into the IDE. You can then import the packages in your code and start building your own mobile applications. The Codename One Open Source API provides rich portability for a large number of mobile devices. It features support for device components like GPS, Gravity Sensor, Camera, etc. that can be used for building applications that use these hardware components. Another great feature of Codename One API is that it provides interfaces for embedding native Operating System component or code directly inside the API itself, so that, if some of the developer’s requirement is not present in the API, he can add the functionality himself. The native coding language used is Dalvik-Java for Android, Objective C for iOS. Codename One has a Designer with a GUI builder featuring layout managers to allow developers to create mobile applications with visual drag and drop components to create application interfaces. It also features live preview of the created interface on a number of devices. The Designer integrates with the Java IDE plugin and does not require any coding. The GUI Designer can also be used by novices without experience of Software development to create basic GUI applications. The Codename One simulator simulates applications on a number of devices. Developers can test mobile applications to see how they run on various devices. It supports previewing device events like rotation, user input, etc. It also allows developers to perform quality testing for mobile applications. The device simulator is very fast and takes minimum time to load an app. All Codename One application builds occur in the Codename One Build Server. Codename One LIVE lets developers to preview live changes being made to their applications. When an application is successfully ‘built’, the application can be installed and previewed instantly. Codename One is a promising platform for Java developers to introduce them to the world of mobile application development. 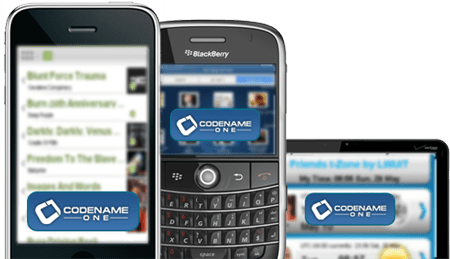 Codename One provides Java for iPhone, iPad, Blackberry, Windows Phone, Android and others. Download the Codename One plugins below and start building mobile apps.